Studying New Media & Digital Culture at the University of Amsterdam. 96 days ago, a crowdfunding project started and was widely spread through Facebook, Linked-In and other social media. It all started with the 17-year old Boyan who had a plan. A plan to do something about the plastic pollution problem and to clean up the oceans. His idea turned into a concept, into research, studies, volunteers and eventually into a crowdfunding campaign. The Ocean Cleanup was born. There have been many ideas for cleaning it up, but these all involved vessels and nets that would ‘fish’ for plastic. Not only would by-catch and emissions likely cancel out the good work, but also, due to the vastness of areas in which the plastics concentrate, such an operation would cost many billions of dollars, and thousands of years to complete (The Ocean Cleanup). But Boyan got an other idea. Instead of moving around the oceans to remove everything, he wants to take advance of the currents that already exist in the oceans. Therefore, his operation to remove the plastic will costs a lot less and won’t take thousands of years. After performing a year of research, in June 2014 The Ocean Cleanup announced the successful outcome of their study which confirmed that the concept is indeed likely a feasible and viable method to remove almost half the plastic from the Great Pacific Garbage Patch (The Ocean Cleanup). The next step, of course, is to get the money to turn this idea into reality and to remove this amount of plastic from the oceans. Bringing people together to fund a project like The Ocean Cleanup is the (already a few years existing) phenomenon of crowdfunding. In their research into this phenomenon, Belleflamme, Lambert en Schwienbacher point out the objective of crowdfunding: “to collect money for investment which is generally done by using social networks, in particular through the Internet (Twitter, Facebook, LinkedIn and different other specialized blogs)” (2). The Ocean Cleanup aims to collect two million USD in 100 days and started their crowdfunding campaign on the 3rd of June. The funding is now at 89% and they have only 4 days to go. Are they gonna make it? An other interesting question considering this project is what will happen if their call for funding won’t raise enough money to cover this ‘high-end’ technology project. Luckily enough, that’s something they have thought about. 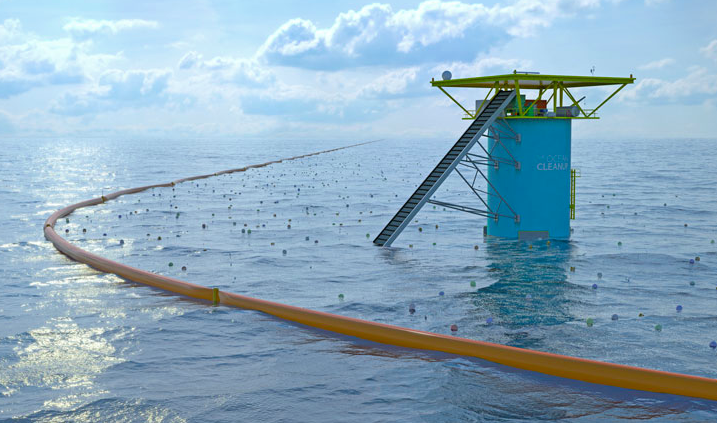 The Ocean Cleanup crowdfunding campaign is a flexible funding campaign. This means that all donations directly contribute to the cause, even if the target is not reached. As CEO and co-founder Brad Damphousse of the crowdfunding platform GoFundMe in an article to Mashable says: “through social media our words can be fast and widely spread.” Because words can be spread this easily in a network nowadays, we can achieve something together. This is something that could not be done in the past. Or at least not that easily. The only thing is: if everyone wants to start a business, project or charity by crowdfunding, how do we select the projects worth funding for? I think what’s really helping the project of The Ocean Cleanup, is that it’s quite easy to relate to. Boyan is a student with a plan and a mission, like we’re all people with ideas. It’s transparent and you don’t have to be suspicious about where your money is going to. Like Belleflamme, Lambert en Schwienbacher address, a strong advantage of this form of financing is the attention that the entrepreneur may attract on his/her project or company (28). Not only is The Ocean Cleanup getting money for this complex operation, it is also a form of agenda setting for the whole plastic pollution problem. We all have to decide for ourselves which projects and organizations are worth funding for and if you even want to be part of a crowdfunding project. But if you care about our seas and happy fish: you have only 4 days left! Belleflamme, Paul, Thomas Lambert en Armin Schwienbacher. Crowdfunding: Tapping the Right Crowd. Diss. (Digital Business Models: Understanding Strategies) Louvain School of Management: Paris, februari 2011.